Call now: 02071 313 777 97. If you require jump start services for your car, then please approach us, as we are a team of professionals who know what we are doing. Do not let an inexperienced person jump start the battery of your car. If you or a friend tries to do a car jump start, there is a very high possibility that it can cause some injury. This is because the car batteries is highly inflammable and even a small spark can cause a serious fire. Our professionals make sure that proper care is taken to ensure that before your car jump start procedure is started the likelihood of your car battery exploding is eliminated. 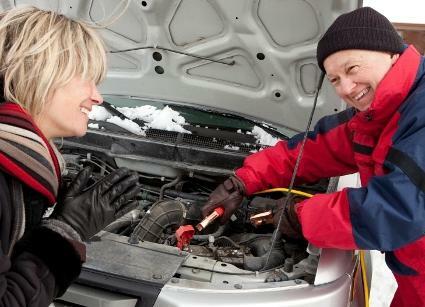 The other real danger in not approaching a professional for jump start services is that if the voltage used is inappropriate your car’s onboard computer can be destroyed. Therefore a person who performs a car jump start should be thorough with their car manuals. How many of you who are in need of a car jump start in London have even read a car user manual once? This is why, you need to call us, if your car battery has drained and you require jump start services anywhere in London and surrounding areas. We offer jump start services to other kind of automobiles as well. If you are stranded on the road side – don’t worry. Just give us a call and our 24 hour team would be ready to assist you within an hour. Our team uses the most sophisticated tools to make sure that your vehicle jump start is done in a quick and efficient manner without any other damage to it. After our technicians jump start your car, they will perform a thorough check of your car battery charger as well as you battery. If any of these require replacement, we offer those services as well. Professional Car Jump Start Service at Low Price. We get to you in 40 minutes. We believe in offering exceptional customer service to all our clients regardless of whether it is day or night. If your vehicle is stalled, it could also be due to an absence of fuel or any other mechanical problems. In such cases as well, our team would assist you in getting the help of professionals to address the issue. In case, you have a dead car battery and your vehicle is blocking traffic, we also help you move your vehicle to a nearby outlet for replacing or reconditioning your battery. If your heavy vehicle requires jump start services in London we are the right people to help. We carry professional equipment to provide the right amount of voltage to any vehicle with a flat battery that requires to be jump started. Approach us to have your car jump started safely and without causing a battery explosion. Battery Jump Start EC2A EC2M EC2N EC2P EC2R EC2V EC2Y, Car Battery Charger Moorgate, Liverpool Street. Jump Start EC4A EC4M EC4N EC4P EC4R EC4V EC4Y, Jump Starter Services Fleet Street, St Paul’s. Car Jump Start WC1A WC1B WC1E WC1H WC1N WC1R WC1V WC1X, Battery Jump Start Bloomsbury, Gray’s Inn. To receive an instant quote on your mobile go to:Car Transport Quote on Mobile.